The two Sikh men looked puzzled. They had been looking up at me since I first got on the train in Bangkok. They would squint their eyes at me, then glance at each other, carrying on a vibrant conversation. I had no idea what they were saying or what was happening inside their turbaned heads. I smiled and mimed the wings of an airplane, telling them I was headed to the airport. They nodded and smiled back. It was 1995, and I was heading home after a week in Thailand on a shoot for a TBS special. My little video camera and I had witnessed the extreme body-piercing and fire-walking rituals during the Vegetarian Festival in Phuket, and met a hill tribe medicine man who did magical tattooing in villages near Mae Hong Son on the northern Thai border with Myanmar. As I headed home, I opted out of the comfort of a cab – which would take an hour and a half in the notorious Bangkok traffic to get to the airport – and instead took the hoi polloi train from the city’s Hua Lamphong station. A ticket cost only 5 Thai baht, which is about 15 cents. The train car was packed with people. I was the only Western farang among them (farang is the Thai word for foreigner. But these Sikhs, most likely from India, were also foreigners in the Kingdom of Thailand.). As I rubbed shoulders with the locals in the dank, last car of the diesel train, I gripped the hanging loop strap over my head. In my other hand, I held a volume the Lord of the Rings trilogy, which I tried to read as the train squealed and groaned, our bodies swaying as the car rocked and lurched along the tracks. Then it dawned on me: The men were looking at the book. On the cover of this paperback version of The Two Towers was a striking image of Gandalf the White, with a magical orb of bright light hovering over his outstretched palm. He looked as likely to be from Srinigar as from Endor. These guys thought I was reading a holy text. As the train slowed to the Don Muang airport stop, I started to gather my luggage. The Sikh gentlemen reached toward me and gestured to see the book. One of them leafed through it. “English?” he asked. I nodded. And he held the book up to his forehead as if to bless it. His friend took it from him and did the same, revering the book as sacred and mouthing a prayer as he lifted it up. They nodded to each other and then handed the book back to me. Big smiles from all of us. Seconds later I was on my way, newly blessed and ready for the long flight home. 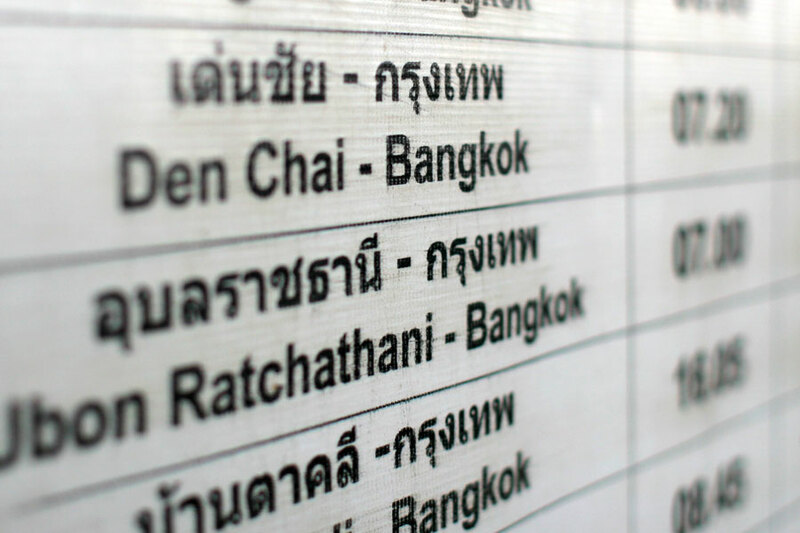 Now it’s 2011 and I’m on that train again, same line, heading north, but going an hour past the old airport stop (Don Muang has been supplanted by the glittering new airport – and a fancy new train system to reach it – east of town). I’m heading to the town of Ayutthaya. It’s a little pilgrimage to one of my favorite Buddha images. Years later I would see it in person. 1994. I was on a honeymoon, en route to Bali, and we had a day in Bangkok each way. The new bride, Melissa, and I asked friends who had been to Thailand what a good day trip would be to get away from the ridiculous bustle of Bangkok. They suggested going to an ancient capital of Siam that had been ransacked long ago but still had amazing ruins. I became especially excited when saw a photo in the guidebook of the Buddha I knew from that album. 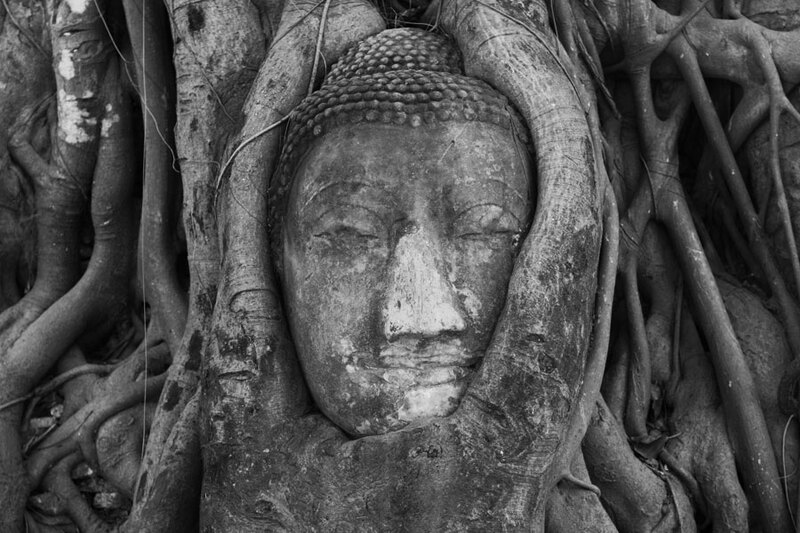 Sometime after Ayutthaya was conquered in the year 1767, the head from a statue was left at the base of the tree at the Wat Mahathat temple and somehow – either by accident or with a little help from human hands – the head became part of the tree. I took lots of photos on 35mm black and white film. As a birthday gift, Melissa created a triptych of some photos from that trip, with black and white prints colored a saffron, near-sepia tone. For her birthday, I made a video of our trip of photos accompanying several of our favorite songs. 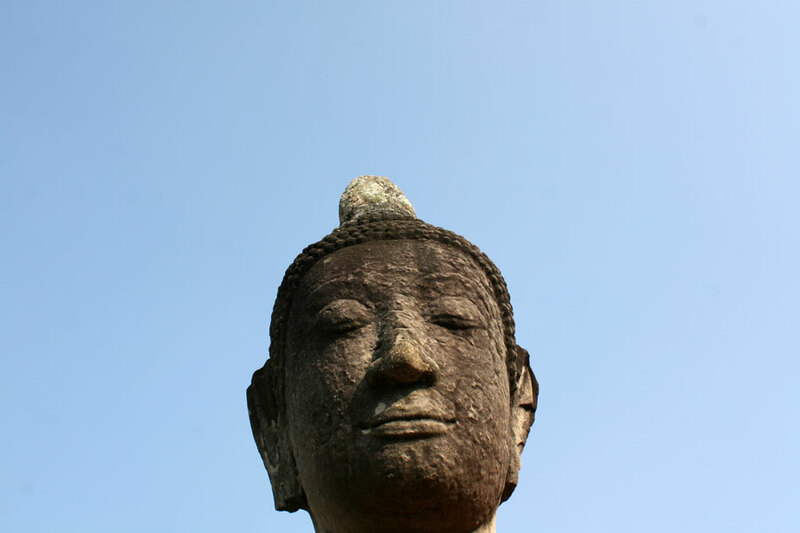 The pictures from Ayutthaya were set to Van Morrison. When I look at those photos, there’s so much in them that no one else can see. The emotions of the time. The smells and sounds of the day. The young girls in their purple and white school uniforms who asked us to practice English with them. Seventeen years on the images are bittersweet. I still have the triptych above my desk in the home office. And I suppose it’s fitting that it represents to me the idea of impermanence. A Buddhist will tell you that nothing is forever (lives, joy, sadness, marriages), and all we have is now. I try to think about that as I revisit Wat Mahathat. The sculpture is there, wrapped in roots, though now it’s roped off. Its nose is a bit sharper than I remember. As I photograph it, I find it hard to concentrate because a group of Japanese tourists – many of them wearing cowboy hats, for goodness sake! – huddle around the tree, taking turns to have their pictures taken in front of the head, keeping their be-hatted heads lower in the shot than the Buddha’s (a sign says it’s insulting to Thais to put one’s head above the Enlightened One’s). In between poses, I get a few photos sans tourists. The tree and stone are so monotone that the color photos appear black and white. I’m having a hard time having the moment I had hoped for. I wanted some one-on-one time with the stone head. To have a little talk. Some time to reconcile past and present. But all I have is now. This moment is what it is, cowboy hats and all. I think this notion of “now” is a philosophy I believed the first time I was here. But when you’re with someone you love so much, chatting with teenage girls who want to speak English with the tourists at the ruins – and they get giddy when they understand the word “honeymoon!” – you don’t think about impermanence at that moment, only forever, everlasting. 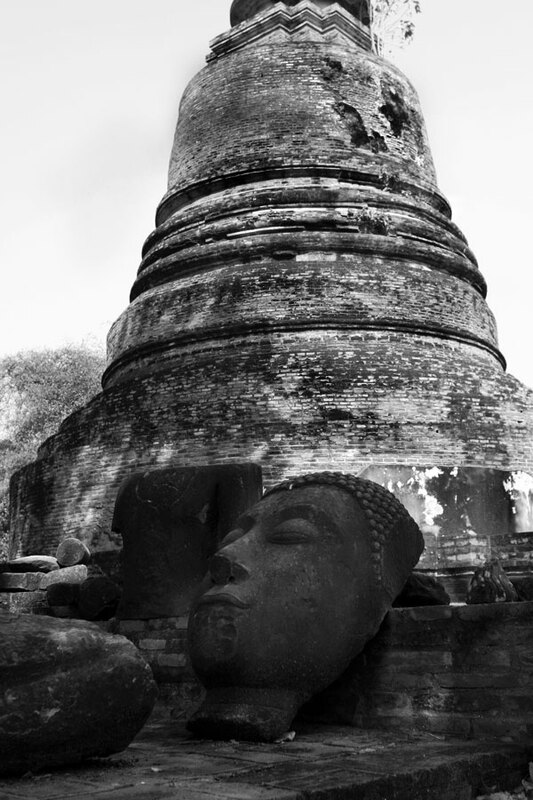 Ayutthaya will always be in black and white for me.